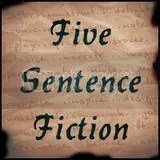 Five Sentence Fiction – What it’s all about: Five Sentence Fiction is about packing a powerful punch in a tiny fist. Each week I will post a one word inspiration, then anyone wishing to participate will write a five sentence story based on the prompt word. She clut ched the gift tighter than she meant to, took a deep breath and entered the room. She swallowed the lump in her throat, leaned over hugged her best friend and grasp the tiny hand, the words from her doctor drowning out her friends proud words of motherhood. “I’m sorry Sarah you will never have children,” he’d said. Tears clouded her vision as she lifted the precious bundle, pressing her face into the seductive baby smell. ← Winner! 2 Sentence Horror Contest! I loved the story, it is full of emotion. Thank you so much for your kind comments. I am so glad you chose to stop by the Cow Pasture Chronicles. I look forward to hearing more from you. Please stop by again. I will thank you for inviting me. Glad you stopped by and enjoyed strolling through the Cow Pasture. I hope you will come again. Such a difficult moment, well put! Thank you Lisa for your kind comments. I’m glad you enjoyed it and thanks for stopping by the Cow Pasture Chronicles. I look forward to hearing more from you. Full of emotion and imagery. Good one.